Although, the growth in mobile subscriber base has slowed down considerably over past few months, May 2012 saw a healthy growth after dismal April figures. 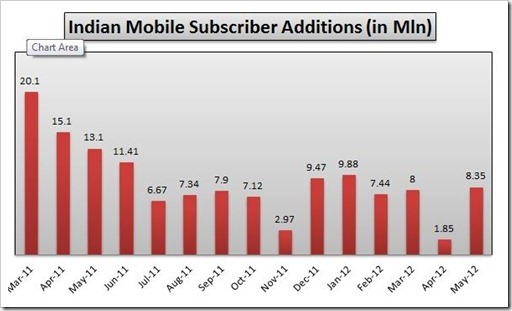 According to the TRAI report for May 2012, India added 8.35 million new subscribers taking the overall mobile subscriber base in India to 929.37 million. Here is a look at monthly subscriber additions since March 2011. – Rural India (5.81 mln) added more than double the subscribers as compared to Urban India (2.53 mln). Rural monthly growth rate was 1.78% as compared to 0.43% of Urban India. – Out of total 929.37 million, 68.33 mln were active mobile subscribers in month of May. – 3.6 lakh new Broadband subscribers were added in month of May taking total tally to 1.43 crore. – India has a total telecom subscriber base (wireless+wireline) of 960.90 mln. Bharti Airtel added 2 million new subscribers to its kitty accounting for 24% of all the new additions in May. Their total base now stands at 185 million. Idea added 17.6 million taking their tally to 116 million by end of May. After dismal last few months, where Tata was continuously loosing subscribers, they managed to add 307k subscriber. Tata’s total subscriber base now stands at 81.5 million. 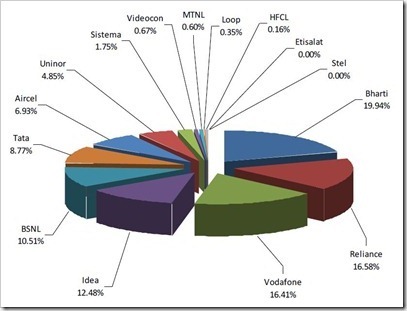 The 2 PSU operators BSNL and MTNL were the only operators who witnessed a negative growth in May 2012. 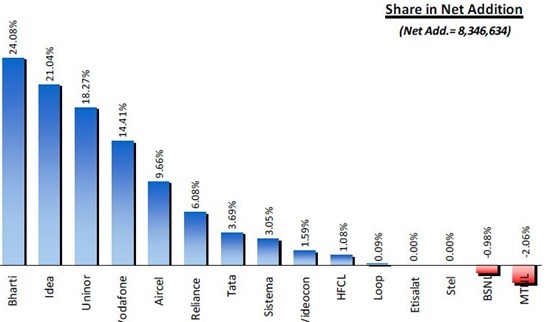 While Bharti is way ahead with close 20% market share in India, Reliance (16.58%) and Vodafone (16.41) are having a close battle. Reliance currently has 154 million subscribers as compared to 152.5 million of Vodafone. Uninor, who is one of the late entrants in Indian Telecom market now has over 45 million subscribers and accounts for close to 5 percent of Indian mobile market share.